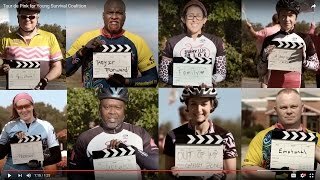 I will be participating in the Young Survival Coalition's Tour de Pink South Ride in April 2018. I'm the captain again for Team Under the Big Top and am thrilled to see the enthusiasm of my crew who hail from all over the country. What's the deal with that name? As an oncology social worker and licensed clinical social worker, I've been a witness for 12 years to the circus cancer can be. I've seen young women's lives and those of the ones they love turned upside down with the party crasher cancer is. My husband, Bryan, designed the logo (go Bryan!). I've long held the belief that survivors can tamp down this circus-like chaos and reclaim themselves. I've seen it happen. Seeing the cyclist on the logo come out of the tent ready to go is a sign of that turning. I know firsthand from being a previous YSC Tour de Pink rider what it means to say that it is so much more than just a bike ride! With a lovely, big-hearted, dedicated group of people all on bikes riding 200+ miles, it’s service in motion - honoring survivors, raising awareness and supporting important programs for young women affected by breast cancer. The must-reach-goal for each rider is $2,500. Where does that money go? What does it do? I get it. You want to see your money at work. Your donation will support the Young Survival Coalition (YSC) and ensure that no young woman faces breast cancer alone. YSC is the premier organization providing supportive services, education and resources for young women affected by breast cancer. At any stage. At any point in her journey. - $25 could fund YSC materials at three healthcare providers’ offices. - $100 could provide a Newly Diagnosed Navigator to six women when they need it most. - $250 could allow us to train four survivors to serve as 1:1 peer supporters. - $500 could fund a Young Empowered Survivor (YES) educational program. - $1,200 could pay for two young women to travel to our annual conference for young women affected by breast cancer. May I please count on your support to help with fundraising? I hope so! Please know that any amount is important and helps! In a time where many are in need and the asking is often, I truly appreciate your consideration. I'll be getting Diana (my Fuji Supreme bike) tuned up and hitting the familiar roads and routes around my hometown of Atlanta. I'll keep you posted on how it's going. Thank you in advance for your support! I deeply appreciate your generosity. For all those busting out of that circus tent. And in honor of amazing Jean Jean. Here's to reaching your goal! Enjoy the ride! Go Jean! So proud of you!